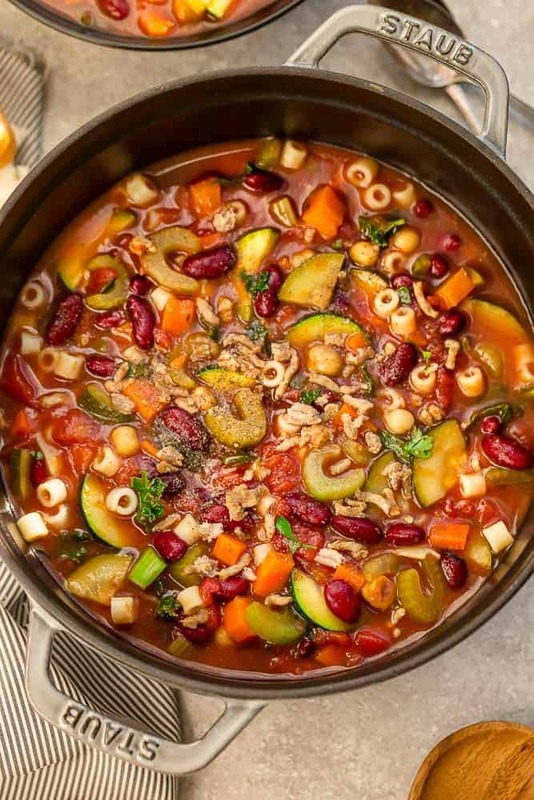 Instant Pot Pasta e Fagioli Soup is the perfect comforting dish on a cold day. 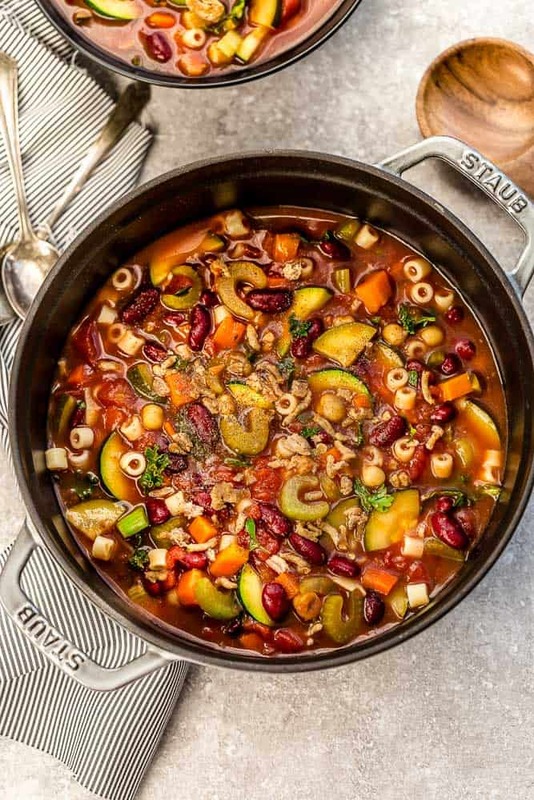 Best part of all, this Italian soup is packed with hearty vegetables, beans and pasta and is so easy to make in an Instant Pot pressure cooker! With the frigid temps we’ve been getting, soup has been on heavy rotation around here. We are soup fanatics and can have soup all year round. But even more so once the weather cools down. 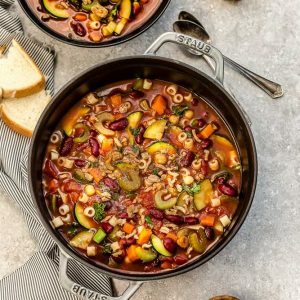 This Instant Pot Pasta e Fagioli Soup has been happening a lot around here. We already shared this copycat Olive Garden recipe using our slow cooker and I couldn’t wait to see how it would work in our Instant Pot. It cooks up thick, hearty and full of savory Italian flavors. 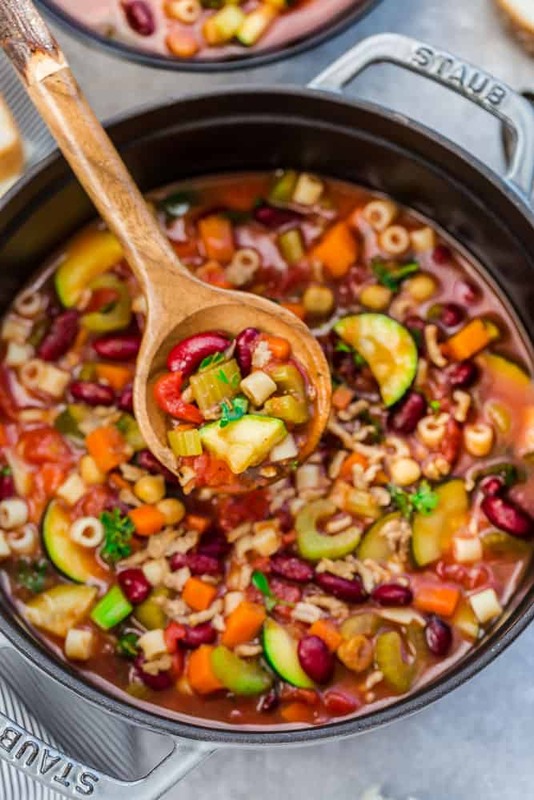 The best part of all, this yummy soup is loaded with healthy vegetables, ground turkey (or beef) and beans. Plus, it’s super simple to make in your instant pot or in a big Dutch oven on the stovetop (see recipe notes for stovetop version) and perfect for busy weeknights. You start off by sauteing the onions, ground turkey (or beef if you prefer) and spices in the Instant Pot. Add the celery and carrots just until they start sweating and then you’re going to add the seasonings, tomato sauce and beef broth. Lock the lid in place and turn to PRESSURE COOK on HIGH for 4 minutes. Once the 4 minutes is up, allow the pressure cooker to release naturally for 8 minutes, then turn the valve to VENTNG. Carefully open the lid and stir in the al dente pasta. Serve hot with a side of crusty bread, a sprinkle of parmesan cheese and some fresh chopped parsley, if desired. **NOTE about pasta – **If you plan to freeze this or serve the next day, leave out the pasta and cook on the side and then combine when you are ready to enjoy. This helps the pasta not get soggy. This hearty soup is especially perfect for those cold nights when you don’t want to go out. Just grab a blanket and curl up with a cozy bowl. Serve the soup with a side salad, crusty bread and dig in! 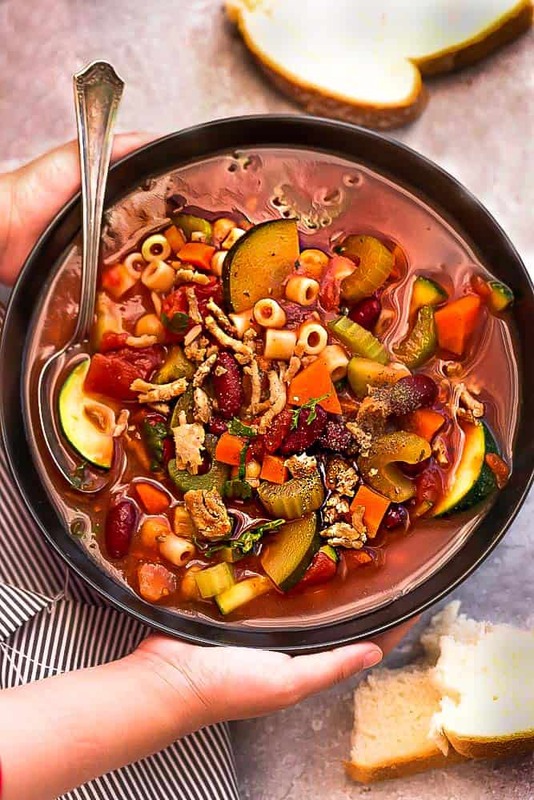 Instant Pot Pasta e Fagioli Soup is the perfect comforting dish on a cold day. 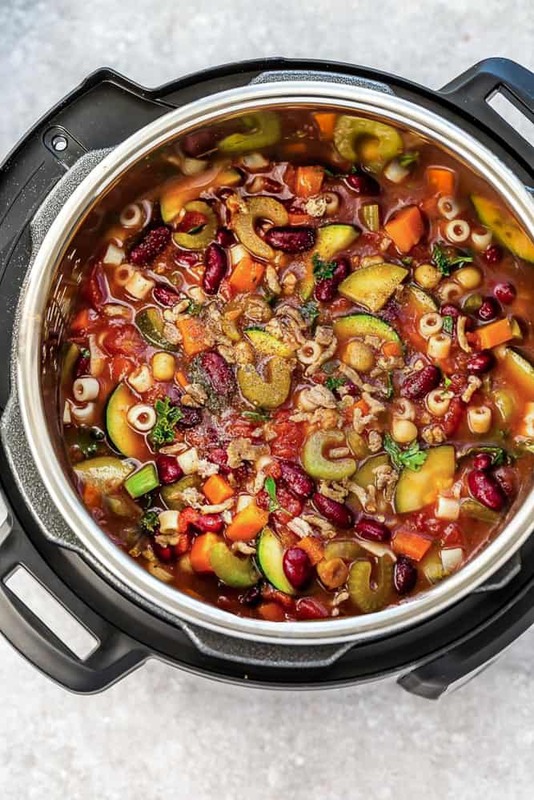 Best part of all, it's packed with hearty vegetables, beans and pasta and is so easy to make in an Instant Pot pressure cooker! Plus stovetop directions. Press the SAUTE button on the Instant Pot. Allow to preheat or until it beeps. Add oil to the inner pot and saute the onions for 1-2 minutes until fragrant. Add the ground turkey, garlic and red pepper flakes. Cook and crumble until meat is brown and no longer pink. Drain any fat and return the pot back to the Instant Pot. Add the celery, carrots, diced tomatoes, tomato sauce, beef broth, Italian seasoning, bay leaf, fennel seeds, kidney beans, and zucchini. Press Cancel then close the lid. Press the MANUAL (older models) or PRESSURE COOK (newer models) button and set for 4 minutes. Turn the valve to SEALING. After the soup cooks for 3 minutes and the instant pot beeps, allow the pressure to release naturally for 2 minutes. Then turn the valve to VENT to release the pressure. Once the pressure is released, open the lid stir in the uncooked pasta. Press the SAUTE button cook for another 5-6 minutes, or until the pasta is tender and cooked. If soup is too thick for your liking, add more water as needed. Season with salt and black pepper to taste and discard bay leaf. Stir in balsamic vinegar if desired. Serve warm with bread, sprinkled Parmesan cheese and garnish with parsley if desired. In a large heavy bottomed pot or dutch oven, heat olive oil over medium heat. Add onion and saute for 1-2 minutes until fragrant. Add the ground turkey, garlic and red pepper flakes. Cook and crumble until meat is brown and no longer pink. Drain any fat and return the pot back to the stove. Add the celery, carrots, diced tomatoes, tomato sauce, beef broth, Italian seasoning, fennel seeds, bay leaf, kidney beans, and zucchini. Bring soup to a boil, then reduce heat and allow to simmer for 20 minutes. Season with salt and black pepper to taste and discard bay leaf. Stir in balsamic vinegar if desired. Excellent soup! Thank you for sharing.